Most social psychological research on anti-immigration prejudice has examined the attitudes of the “ingroup” toward the non-citizen outgroup (often referred to as immigrants). In this strand of research, competition- and identity-based concerns have been shown to play a pivotal role: Perceiving immigration as threatening material resources as well as identifying with the nation have indeed been firmly established as antecedents of anti-immigration prejudice (e.g. Blank & Schmidt, 2003; Green, Sarrasin, & Fasel, 2015; Wagner, Christ, & Heitmeyer, 2010; Zárate et al., 2004). However, to our knowledge, no empirical evidence is available on whether these factors also drive the opinions of citizens with an immigrant background or of immigrants. Given the demographically multicultural composition of contemporary societies, it is insufficient to restrict research on anti-immigration prejudice to one sector of the population, the national citizens. Moreover, that a part of citizens has foreign roots should be systematically taken into account. In the present research, we thus examine threat perceptions, national identification, and two facets of anti-immigration prejudice among natives, citizens with foreign roots and immigrants. Based on Realistic Conflict Theory (Sherif, 1966) or Social Identity Theory (Tajfel & Turner, 1979), social psychological research on anti-immigration prejudice usually makes a distinction between the ingroup—generally defined as the national citizens (sometimes further restricted to individuals with no foreign origins)—and the immigrant outgroup (most often only vaguely and broadly defined). However, because of the increasingly complex demographic make-up or “super diversity” (see Vertovec, 2007) of most host countries, “the designation of ingroup and outgroup is more complicated than early theoretical models might suggest” (Deaux, 2000, p. 423; see also Leong & Ward, 2011). Indeed, in many countries, a long history of immigration has resulted in increased numbers of individuals that are born in the country but have foreign roots. Some countries have second-, third- or even fourth-generation “immigrants”. Moreover, many individuals have mixed origins (they have both native and immigrant origins, or parents originating from different countries). Accordingly, we argue it is necessary to go beyond the citizen ingroup vs. immigrant outgroup distinction when studying anti-immigration prejudice. First, individuals with no foreign roots (hereon called “natives”) should be distinguished from those with an immigrant background. Among the latter, subcategories are also likely to exist, according to individuals’ history or ties with the receiving country. Distinctions can indeed be made between individuals of immigrant descent possessing national citizenship vs. not, or between first- and second-generation immigrants (Bolzman, Fibbi, & Vial, 2003). Generally, the longer the history or the stronger the ties between individuals with an immigrant background and their country of residence, the closer their social and political attitudes are to those expressed by natives. Examining attitudes of natives and immigrants across 24 European countries, Schiefer (2013) indeed found that attitudes (e.g. toward gays or unemployed people) of second-generation immigrants are influenced to a greater extent by the cultural values prevailing in the host country than attitudes of first-generation immigrants. Similarly, Callens and colleagues (2014) showed that attitudes towards acculturation strategies among second-generation immigrants shifted towards the strategy preferred by the national majority group (that is, that immigrants should assimilate into the receiving society), whereas first-generation immigrants endorsed to a greater extent the strategy preferred by minority groups (that is, that cultural diversity should be maintained and promoted). Although immigrants recently settled in the receiving society may be already influenced by the expectations showed by national majority group members (Roblain, Azzi, & Licata, 2017), conformism to dominant norms should be more pronounced among long-term immigrant group members at later stages of their acculturation process (e.g. Politi & Staerklé, 2017). Anti-immigration prejudice can be expressed through opposition to the arrival of newcomers or through negative views against immigrants already in the country (Ceobanu & Escandell, 2010). The handful of studies comparing citizens and immigrants have shown that the latter are more positive and open toward both. For example, based on data from five rounds of a large-scale European survey (European Social Survey, ESS), Just and Anderson (2015) found that native-born individuals’ views regarding the arrival of newcomers were more negative than those of foreign-born individuals (for similar results in Australia, see Dandy & Pe-Pua, 2010). Among the foreign born, those possessing national citizenship expressed more exclusive views than immigrants. Also using ESS data, Kolbe and Crepaz (2016) found that foreign-born, naturalized citizens were less willing than immigrants to grant immigrants access to social benefits. In the same vein, Valentová and Berzosa (2012) revealed that, in Luxembourg, natives expressed the most negative attitudes toward established immigrants followed by second-generation and then first-generation immigrants. In fact, the views expressed by second-generation immigrants were closer to the natives’ views than to the attitudes of first-generation immigrants. Examining attitudes toward immigrants living in Switzerland, Sarrasin and colleagues (2015) also demonstrated that natives’ attitudes were more negative than those of immigrants. Further distinguishing between two immigrant groups, they found that members of a group with a longer immigration history (Italians) expressed more negative attitudes than members of more recent immigrant groups (from former Yugoslavia). Based on previous research, we thus expect that natives express more anti-immigration prejudice than individuals with an immigrant background (H1; see Figure 1 for all predictions). In addition, attitudes of individuals with more durable or closer bonds with the host country should be more negative than those with more recent or distant bonds. In the current study, we examine antecedents of different facets of anti-immigration prejudice: opposition to newcomers and opposition to granting rights to established immigrants. We have similar predictions for both outcomes. While there are indisputable group differences in anti-immigration prejudice, whether the mechanisms underlying attitudes differ remains largely understudied. To fill this gap, we assume here that two major antecedents of prejudice—threat perceptions and national identification—matter in the formation of opinions among natives and individuals with an immigrant background. First, rejection of outgroups often stems from real or perceived competition (e.g. Sherif, 1966). Unsurprisingly, anti-immigration prejudice is partly explained by perceptions of immigration and immigrants as a threat to the nation’s economy (Green et al., 2015; Stephan et al., 2009; Wagner et al., 2010; Zárate et al., 2004). Newcomers or immigrants settling in the nation are often portrayed as being in competition with residents of the receiving country for goods such as jobs, housing and benefits. Such portrayals then generate negative views. We thus assume that perceiving immigration and immigrants as a threat to the nation’s material goods is related to heightened anti-immigration prejudice (H2). Opposing predictions can be made regarding differences in threat perceptions between natives and individuals with an immigrant background. On the one hand (H3a), if threat perceptions are based on fears of competition, those with foreign roots may conceive newcomers as competitors for the same resources (e.g. jobs, accommodation). In addition, some individuals with foreign roots may indeed fear that, by taking advantage of the host country’s material goods (e.g. social benefits), newcomers tarnish the image of immigrants (for qualitative evidence in Switzerland, see Wimmer, 2004). These different fears may be even more prevalent among immigrants, in comparison to citizens of foreign descent who typically are more integrated and have access to resources such as occupations in a broader range of sectors. On the other hand (H3b), according to the kinship-solidarity assumption (Just & Anderson, 2015), individuals with an immigrant background are more likely to take the perspective of newcomers. Indeed, individuals with an immigrant background should know more than natives of the challenges (e.g. discrimination, process of integration) newcomers face. In addition, they are more likely to acknowledge that migrant reality is more complex than illegitimate use of host country resources. Supporting this claim, Just and Anderson (2015) found that foreign-born individuals felt less threatened than native-born individuals. This should be even more so the case among individuals who have a shorter history with the host country. In addition to perceived competition, identity-related factors drive reactions toward newcomers to the nation (note that individuals attached to the nation also tend to express high levels of perceived threat; Raijman et al., 2008; Verkuyten, 2009). Based on the assumption of ingroup favouritism (Tajfel & Turner, 1979), feeling close to or identifying with the nation should relate to negative views against outroup members such as immigrants. Evidence supporting this assumption has been found in numerous national contexts (e.g. in Germany, Pettigrew, Wagner, & Christ, 2007; in the Netherlands, Verkuyten, 2009; across 22 European countries, Visintin, Green, & Sarrasin, 2017; for more nuanced predictions related to boundary conditions see also Politi, Gale, & Staerklé, 2017). Overall, we expect here too that identifying with the nation is related to heightened anti-immigration prejudice (H4). Some research has further suggested that the impact of national identification on anti-immigration prejudice is most apparent when individuals endorse an exclusive, nationalist view of the nation (Pehrson, Brown, & Zagefka, 2009) or live in countries with exclusive citizenship regimes (Ariely, 2012). This calls for systematically considering the content of national identity when studying the impact of identification with the nation. On average, immigrants tend to identify with the host country moderately, and less than natives (for a review, see Verkuyten & Martinovic, 2012). However, this may not be the case for all immigrant groups. For instance, in the Netherlands, Turkish but not Moroccan immigrants were found to identify less than natives with the nation (de Vroome, Verkuyten, & Martinovic, 2014). In addition to national differences, the study revealed that a broad array of social and economic factors (e.g. social integration, occupational prestige, proficiency in Dutch) explained why some immigrants reported higher identification with the host nation than others. More closely related to the topic of the present study, differences as a function of individuals’ history with the host nation have been revealed too: In the Netherlands and Germany, second-generation Turkish immigrants and those who possessed Dutch/German citizenship were found to express stronger attachment to the host nation than first-generation immigrants (Martinovic & Verkuyten, 2012). Based on these results, we expect natives to express stronger national identification than individuals with an immigrant background (H5). Among those with an immigrant background, we expect those with longer or closer bonds with the host country to identify to a greater extent with the host nation. Differences in national identification should explain the native-immigrant gap in anti-immigration prejudice (H6). The outlined predictions were tested in Switzerland with data from the 2013 MOSAiCH survey (Measurement and Observation of Social Attitudes in Switzerland), which included the International Social Survey Programme (ISSP) questions of the same year (ISSP Research Group, 2015). In Switzerland, in 2015 a quarter of the resident population did not possess national citizenship (24.6%) and 35.9% had foreign roots (Swiss Federal Statistical Office—SFSO, 2017). Until the ’70s, seasonal (then settled) labour immigrants from Italy and Spain composed the largest groups migrating to Switzerland. They were partly replaced, from the ’80s, by Portuguese and immigrants from former Yugoslavia. Currently, the largest groups come from neighbouring countries (Germany, Italy, France), Southern (Spain, Portugal) or Eastern Europe (former Yugoslavia, Turkey; SFSO, 2017). Moreover, Switzerland has a strict naturalization policy (citizenship is never automatically granted, not even to the third generation), which explains why only 29% of the first generation and 61% of the second-generation “immigrants” possess Swiss citizenship. In a country with both ongoing immigration flows and a large share of the resident population with foreign roots, it is highly relevant to study residents’ attitudes toward both newcomers and settled immigrants. Altogether 1,234 respondents participated in MOSAiCH 2013. As described below, 1,198 of them were retained for the analyses (605 men and 593 women). We define having an immigrant background when respondents declared that, at the time of their birth, at least one their parents was not Swiss (N = 437). With such a definition, 797 respondents can be considered natives. They all possessed Swiss citizenship but, in addition, twenty-seven declared having at least one foreign citizenship. These respondents were discarded, reducing the natives to 770 individuals. Of the 437 respondents with an immigrant background, we differentiated between those who possessed Swiss citizenship (hereafter “citizens of foreign descent”, N = 225) and those who do not (hereafter “immigrants”, N = 212). Nine respondents were discarded because they provided inconsistent information regarding their citizenship, reducing the citizens of foreign descent and immigrant groups to 221 and 207 participants respectively (forming, together, 35.73% of the final sample). Slightly more than a third of the citizens of foreign descent (38.46%) declared not being born or having arrived as a child (at the age of 10 or less) in Switzerland. One hundred and thirty-one (59.28%) respondents in this group had another citizenship in addition to the Swiss. They came from 41 different countries, with the most represented being Italy (N = 23), Germany (N = 17), Spain and France (both, N = 10). Among the immigrants, the share of individuals born abroad or who migrated during childhood went up to 79.71%. Immigrants come from 46 different countries, with the most represented being Germany (N = 40), Italy (N = 35) and Portugal (N = 19). Compared to official statistics, citizens of neighbouring countries appear to be slightly overrepresented, while individuals from former Yugoslavia and Albania countries (all countries together, N = 32) or Turkey (N = 6) seem to be adequately represented. Means and standard deviations as well as intercorrelations for all scores by group are displayed in Table 1. If not specified otherwise, all items ranged from 1 (totally agree) to 5 (totally disagree). Some item scales were reversed such that high scores indicate opposition to newcomers and to granting rights to established immigrants, stronger threat perceptions, a stronger identification with Switzerland, and stronger nationalism. Means, standard deviations and intercorrelations of independent and dependant variables, by group. Opposition to newcomers was measured with two items (α = 0.65, r = 0.48, p < 0.001). First, respondents were asked whether the number of immigrants to Switzerland should be increased a lot (1) or reduced a lot (5). They were then asked to give their opinion about the Schengen agreement, with the following question “Since the 1st of July 2002, Switzerland has adopted the free movement of persons agreement, which gives to all Europeans the right to work and live in Switzerland. Do you think that the free movement of persons had positive or negative impact of Switzerland’s situation?” (from 1 = very positive to 5 = very negative). Opposition to granting rights to immigrants was measured with four items (α = 0.84). Respondents were invited to state whether “the following rights should be granted to everyone living in Switzerland, including those who do not possess Swiss citizenship”: to hold public demonstrations, to hold public office, to have the right to vote and be a candidate in political elections, and to initiate a public referendum. An exploratory factor analysis showed that opposition to newcomers and opposition to granting rights to immigrants were distinct factors. The hypotheses (see Figure 1) developed in the present research were tested with a path model.34 Two contrast variables were used to compare the three groups: Contrast 1 compared natives (2) to individuals with an immigrant background (–1), while Contrast 2 compared citizens of foreign descent (1) to immigrants (–1). Although the strength of the links between the phenomena under study was not expected to vary across groups, we tested whether the two contrast variables moderated these links. In addition, gender (1 = female), age, education (1 = tertiary education diploma) and subjective social class (from 1 = low to 10 = high) were used as control variables. Indeed, in Switzerland, non-citizens, and especially those with less stable residency permits, earn less than citizens (SFSO, 2016a; note that it is not possible to distinguish between natives and citizens with foreign roots). At the same time, non-citizens are better educated (33.9% have achieved tertiary education against only 24.2% of Swiss citizens; SFSO, 2016b), which clearly demonstrates that non-citizens are underemployed. Fit indices showed that the model fitted the data adequately (χ2(20) = 53.36, p < 0.001, CFI = 0.986, RMSEA = 0.037; Hu & Bentler, 1999). Results are presented in Table 2. Notes. Contrast 1: natives vs. individuals with an immigrant background; Contrast 2: citizens of foreign descent vs. immigrants. Only interactions that yielded as a significant effect in regressions conducted on each dependent variable separately were included in the final model. 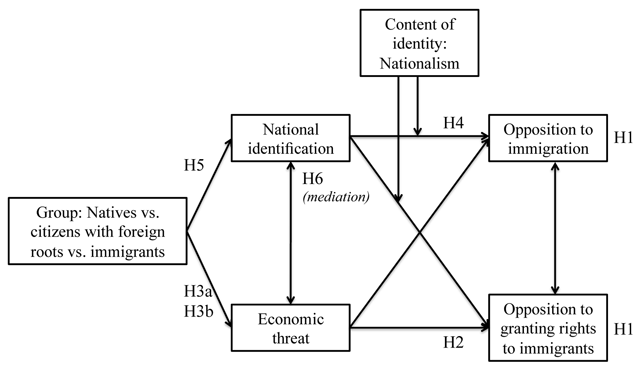 Beyond the estimates presented in Table 2, bivariate relationships between economic threat, national identification and nationalism as well as between the two facets of anti-immigration prejudice were included in the model. *** p < 0.001, ** p < 0.01, * p < 0.05,  p < 0.10. As predicted and in line with previous research (H2), perceived economic threat related to immigration was significantly related to both opposition to newcomers and opposition to granting rights to immigrants. Note that for opposition to newcomers, the effect of threat was moderated by Contrast 2: while significant in all cases, the impact of perceived threat was stronger among citizens of foreign descent (b = 0.51, SE = 0.05, p < 0.001) than among immigrants (b = 0.30, SE = 0.05, p < 0.001). As apparent in Figure 2, when individuals did not feel threatened, there was no significant difference between the two groups (b = 0.02, SE = 0.04, p = 0.68). By way of contrast, among those who felt threatened, citizens with foreign roots expressed more opposition to newcomers than immigrants (b = 0.18, SE = 0.05, p = 0.002). 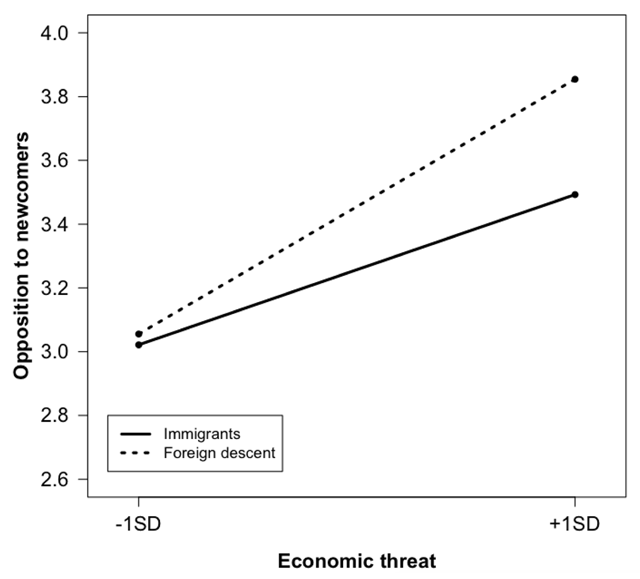 Relationship between perceived economic threat and opposition to newcomers among citizens of foreign descent and immigrants. In addition and lending support to H3b, natives expressed higher levels of perceived economic threat than individuals with an immigrant background. Among the latter, citizens of foreign descent felt more threatened than immigrants. We then examined whether differences in perceived threat explained group differences in anti-immigration prejudice. When it comes to opposition to newcomers, estimation of indirect links revealed that differences in threat explained the higher opposition expressed by natives compared to individuals with an immigrant background (Contrast 1; b = 0.04, SE = 0.01, p < 0.001). When it comes to comparing the two groups with an immigrant background (Contrast 2), a moderated mediation was estimated because threat and the contrast variable interacted in predicting opposition to newcomers. Results showed that differences in perceived threat explained differences in opposition across the two groups, albeit less strongly among immigrants (b = 0.02, SE = 0.01, p = 0.06) than among citizens of foreign descent (b = 0.04, SE = 0.02, p = 0.05). Finally, examination of indirect relationships further showed that both Contrast 1 (b = 0.03, SE = 0.01, p < 0.001) and Contrast 2 (b = 0.02, SE = 0.01, p = 0.05) had an indirect impact on opposition to granting rights to immigrants through differences in perceived threat. Relationship between national identification and opposition to granting rights to immigrants, among natives. Relationship between national identification and opposition to granting rights to immigrants, among individuals with an immigrant background. As predicted (H5), natives were more identified with Switzerland than individuals with an immigrant background. However, there was no significant difference between citizens of foreign descent and immigrants. Although we did not make a priori predictions regarding group differences in nationalism, we nevertheless explored whether the three groups differed in their score of nationalism (results are not included in Table 2). Both contrasts yielded a significant effect: Interestingly, natives expressed lower levels of nationalism than those with an immigrant background. (Contrast 1: b = –0.08, SE = 0.02, p < 0.001), and this difference appears to be driven by immigrants expressing more nationalist views than citizens of foreign descent (Contrast 2: b = –0.18, SE = 0.04, p < 0.001). Finally, examination of indirect links showed that differences in national identification partly explained differences in opposition to newcomers, albeit only marginally (H6; Contrast 1: b = 0.003, SE = 0.002, p = 0.09; Contrast 2: b = 0.005, SE = 0.003, p = 0.07). For opposition to granting rights to immigrants, a moderated mediation was estimated due to the revealed three-way interaction. 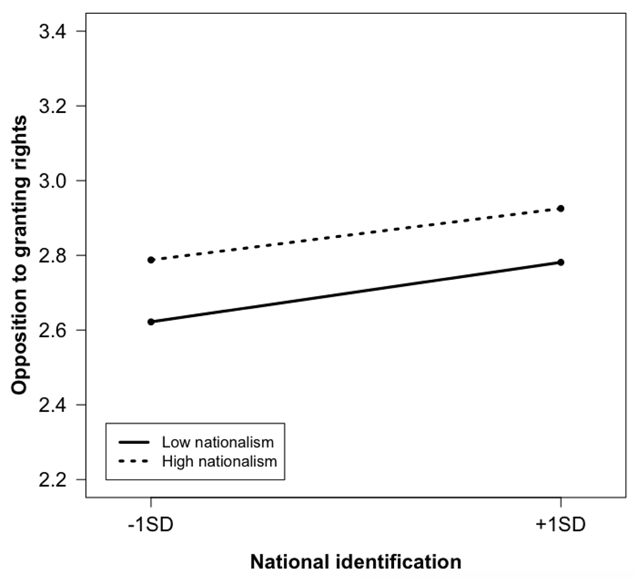 Contrary to what previous research has found (Pehrson et al., 2009), national identification was related to negative attitudes only among natives scoring low in nationalism (b = 0.01, SE = 0.006, p = 0.04; high nationalism: b = 0.004, SE = 0.003, p = 0.21; all other p-values > 0.20). With the exception of natives low in nationalism, H6 was not confirmed for opposition to granting rights to immigrants. The present study examined opposition to newcomers and to rights for more-established immigrants, and two of their major antecedents among natives, citizens with foreign roots and immigrants in Switzerland, a country where a third of the resident population has an immigrant background. As expected, natives expressed stronger opposition to newcomers and were less willing to grant rights to immigrants than individuals with an immigrant background. In turn, nationals with foreign roots expressed more negative attitudes towards newcomers than immigrants, while no differences in opposition to granting rights were revealed between the two groups. Differences between the groups were partly explained by differing threat perceptions: Individuals with an immigrant background—and in particular immigrants—saw immigration, less than natives, as endangering to the economic welfare of the nation. Identification with the nation, in turn, appeared to play a complex role. While individuals with an immigrant background identified less than natives, they reported stronger feelings of national superiority. This finding calls into question the conceptual cross-group equivalence of nationalism measures. It is thus unsurprising that group differences in opposition to immigration and immigrants were not explained by differences in identity-related factors. Of the two mechanisms examined in the present research, the competition-based path appears to better account for differences in anti-immigration prejudice between natives and individuals with an immigration background. While previous research has already revealed group differences in perceived threat (Just & Anderson, 2015) and anti-immigration prejudice (e.g., Sarrasin et al., 2015; Valentová & Berzosa, 2012), our study is the first, to our knowledge, to show differences in the interplay of these concepts. Our findings support a kinship-solidarity explanation (Just & Anderson, 2015): While in all likelihood individuals with an immigrant background compete with newcomers for material goods (jobs, housing opportunities, and so on) to a greater extent than natives, feelings of empathy seem to prevail. This result supports previous research showing that anti-immigration prejudice is above all grounded in perceptions rather than in objective facts. For instance, the actual presence of immigrants has been shown to heighten threat perceptions only through the perceived size of immigrant groups, but not directly (e.g., Schlueter & Scheepers, 2010). Kinship and solidarity probably also explain the lack of differences between citizens of foreign descent and immigrants in willingness to grant rights to immigrants. Respondents with an immigrant background may have had themselves or their relatives in mind as a reference point when answering to the question about rights (see however Kolbe & Crepaz, 2016). This was less likely the case when considering newcomers in Switzerland. Solidarity also very likely explains why perceived threat plays a greater role in explaining opposition to new immigration among citizens of foreign descent than among immigrants. While no difference between these two groups was found among those who reported low threat perceptions, citizens of foreign descent who felt threatened expressed a stronger opposition than immigrants with similar threat scores. Thus, even when perceiving immigration as a threat to the Swiss economy, solidarity may refrain some of immigrants from endorsing limitations to new immigration. Supporting our expectation, natives identified more with Switzerland than individuals with an immigrant background. Perceived national superiority seemed to play an even greater role in shaping negative attitudes among natives: Those who endorsed a nationalistic stance did not support granting rights to immigrants, even when they distanced themselves from Switzerland (note that most respondents reported feeling at least somewhat close to Switzerland). Surprisingly, individuals with an immigrant background—and especially immigrants—expressed stronger feelings of national superiority, which may explain why national identification plays no role in explaining anti-immigration prejudice among those with foreign roots. Highlighting the complexity of measuring individuals’—and particularly among those with foreign roots—relationship with the nation they live in, our findings may result from differences in the meaning attributed to the items as well as in the used data collection mode. First, when relying on items that mention the nation in a non-specific way (“do you feel close…”), the way we expected, natives expressed more closeness than individuals with an immigrant background. The two nationalism items, however, refer to other countries needing to be like Switzerland, and to Switzerland being a better country. Natives may feel that endorsing such items conveys radical right and chauvinistic ideologies. On the contrary, in the case of immigrants, seeing Switzerland as superior to other countries may have resulted from comparisons on a number of economic (or even conflict-related) characteristics on which Switzerland fares well. Second, immigrants may be unwilling to appear ungrateful toward the host country when participating in Swiss surveys, and especially in face-to-face interviews such as in the MOSAiCH. No doubt more research—mixing qualitative and quantitative approaches—is needed to uncover the meaning of national identification and nationalism among individuals with foreign roots (for a similar reasoning, see de Vroome et al., 2014). Overall, the findings of the present study indicate that to gain a more complete and accurate picture of the public opinion on immigration in diverse societies, the viewpoint of individuals with an immigrant background should be examined. Therefore, specific factors driving attitudes of individuals with foreign roots should be systematically considered. Indeed, the current set-up of most large-scale surveys seems to suggest that only the so-called natives develop a negative stance against both newcomers and already settled immigrants, and that if individuals with foreign roots also do so, it is for the same reasons as natives. However, other mechanisms, operating in parallel to some of those usually found among natives (e.g. threat perceptions), may explain how and why individuals with an immigrant background react to immigration: identification with the country of origin as well as normative pressure to assimilate and “act as a native” are factors to consider in future research. 1Analyses conducted with a 5-item threat score (α = 0.73)—encompassing the two economic threat items, two questions measuring symbolic or cultural threat and one question on fear of crime—yielded similar results. 2The ISSP national identity module contains an eight-item battery for assessing national attachment. Analyses conducted on the 2003 ISSP data showed the two items used in the present study are distinct from a more critical and constructive form of national attachment (patriotism) across the 34 ISSP countries (Davidov, 2009). In the 2013 Swiss data, these two items were the only ones that correlated moderately (all other correlations were below .35). 3Because the survey was conducted in a selected number of districts, additional analyses that accounted for the clustered structure of the data were conducted (with the Mplus Complex command). Similar results were obtained. 4Preliminary analyses ensured that that the way the constructs—perceived economic threat, nationalism, opposition to newcomers, and opposition to granting rights to immigrants (national identification could not be included because it was measured with one item only)—were measured in each group was sufficiently invariant as not to bias substantive conclusions drawn from the data. For this, measurement invariance was tested with multigroup confirmatory factory analysis (MGCFA; performed with Mplus 7.0) with the three usual steps, each one stricter than the previous. When comparing increasingly constrained models (e.g. a model with means free vs. constrained to be equal across groups), invariance is reached when changes in fit indices are under given cut-off values (ΔCFI < 0.010, ΔRMSEA < 0.015; Chen, 2007). Results showed that configurational invariance was reached: The general structure was thus valid for the three groups under investigation (χ2(87) = 225.42, p < 0.001, CFI = 0.959, RMSEA = 0.063). A further model shows that metric invariance was also reached (χ2(99) = 257.21, p < 0.001, CFI = 0.953, RMSEA = 0.063; ΔCFI = 0.006, ΔRMSEA = 0.000): Across the three groups, all items played a similar role in forming the constructs (i.e. the latent variables). This means that comparisons of relationships between constructs are trustworthy. Finally, scalar invariance was also established (χ2(111) = 287.28, p < 0.001, CFI = 0.947, RMSEA = 0.063; ΔCFI = 0.006, ΔRMSEA = 0.000), suggesting that means can be compared across the three groups. 5Note that similar results were obtained in separate regression models that did not involve interactions. 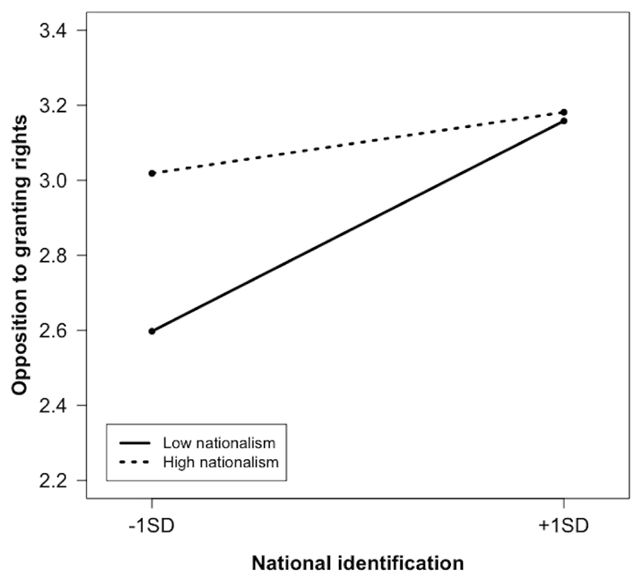 6National identification was significantly related to higher opposition, but only among those who scored low in nationalism (b = 0.43, SE = 0.06, p < 0.001; high nationalism: b = 0.13, SE = 0.08, p = 0.13). 7Individuals scoring high in nationalism did not express higher opposition than those low in nationalism, no matter whether they were weakly (b = 0.08, SE = 0.06, p = 0.16) or strongly (b = 0.08, SE = 0.06, p = 0.22) identified with Switzerland. This research was funded by the Swiss National Science Foundation (National Centre of Competence in Research On the Move and grant # 100014_159336 / 1). Bolzman, C., Fibbi, R., & Vial, M. (2003). Secondas-Secondos. Le processus d’intégration des jeunes issus de la migration espagnole et italienne en Suisse [The integration process of young adults with a migratory bakground from Spain and Italy]. Zurich: Seimo. ISSP Research Group. (2015) International Social Survey Programme: Citizenship – ISSP 2007. GESIS Data Archive, Cologne. ZA5900. Politi, E., & Staerklé, C. (2017). La frontière mince entre accueil et rejet: Le cas des citoyens naturalisés en Suisse [The fine line between acceptance and rejection: The case of naturalised citizens in Switzerland]. In: Butera, F., & Staerklé, C. (Eds. ), Conflits constructifs, conflits destructifs: Regards psychosociaux, 221–236. Lausanne: Antipodes. Stephan, W. G., Ybarra, O., & Rios Morrison, K. (2009). Intergroup threat theory. In: Nelson, TD. (Ed. ), Handbook of Prejudice, Stereotyping, and Discrimination, 43–60. Mahwah: Lawrence Erlbaum Associates. Swiss Federal Statistical Office. (2016a). Salaire mensuel brut selon les branches économiques et les années de service [Gross income based on sector and years of service.] Retrieved from: https://www.bfs.admin.ch/bfs/fr/home/statistiques/catalogues-banques-donnees/tableaux.assetdetail.327911.html. Swiss Federal Statistical Office. (2016b). Niveau de formation [educational achievement]. Retrieved from: https://www.bfs.admin.ch/bfs/fr/home/statistiques/education-science/indicateurs-formation/systeme-formation-suisse/degre-formation/tous-degres/niveau-formation.html. Swiss Federal Statistical Office. (2017). Rapport statistique sur l’intégration de la population issue de l’immigration [Statistical report on the integration of the population with an immigrant background]. Neuchâtel: Swiss Federal Statistical Office. Tajfel, H., & Turner, J. C. (1979). The social identity theory of inter-group behavior. In: Worchel, S., & Austin, W. G. (Eds. ), Psychology of Intergroup Relations. Chicago: Nelson-Hall. Valentova, M., & Berzosa, G. (2012). Attitudes toward immigrants in Luxembourg. Do contacts matter? International Review of Sociology, 22, 341–363. Available at: https://www.tandfonline.com/doi/full/10.1080/03906701.2012.696976.